CRICKET: Many countries had contracted foreign coaches in their endeavour to win the World Cup in the Caribbean, which attracts the biggest prize money and also with it stardom. Teams having foreign coaches are sure to evaluate their performances at the end of the World Cup. Already Greg Chappell, the Indian coach has quit before his time, citing personal and family commitments. Bangladesh coach Dav whatmore has said that he would like to succeed Chappell as Indian coach. The often asked question in Sri Lankan cricketing circles is: Will coach Tom Moody want to stay with the Lankan team or quit for more lucrative offers? So far Moody has been doing a splendid job and there is no doubt that the game is on the up and up in the country, if the success in the current World Cup is an indication. While Moody would be weighing the pros and cons, whether to stay or go, here in the West Indies the story doing the round is that Moody's family would influence whether he stays with Sri Lanka, goes to England or heads home to Australia to work with former state Western Australia. According to Moody, Western Australia had contracted him and asked. He had told them that at the end of the present World Cup, he would discuss with Sri Lanka and see what the future holds for him in Sri Lanka. 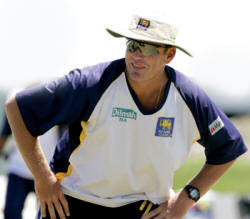 With the results shown so far, it would do Sri Lanka cricket a lot of good if they could persuade Moody to stay. If Sri Lanka wins the World Cup - and there is no reason why they should not - then there is the possibility that Moody would up his price to remain. The Sri Lankan authorities would have to do a lot of negotiating with Moody at the end of the World Cup. Coaches steering teams to success are always in demand, while those not doing so are in great demand to be got rid of. With the West Indies hosting the World Cup, expectations were that they could repeat the feats of Clive Lloyd's team that won the first two World Cup in England in 1975 and 79. But after their resounding success in the group stage, the Windies have crumbled in the Super 8 series and have come in for a lot of flack from most quarters here in the Caribbean. While Michael Holding, Colin Croft and Joel Garner asked for the head of skipper Brian Lara, now comes the cry for Aussie Bennet King to be chopped as the West Indian coach. One might ask what can a coach do when the team loses? A coach can tell and show. All depends how the players put it together out in the middle. Local officials have called for the removal of King and for a full scale investigation into the set up of West Indies cricket. According to Colin Murray and quoted in the 'Guardian'; 'This man (King) has been with this team for quite a while and has achieved nothing. He took the team from Gus Logie when we had just won the Champions Trophy and what has he done with it since - absolutely nothing. I am saying that King must be removed from the position of coach. The only thing that can save him is if by some miracle, the team goes on and wins the World Cup! said Murray. Colin Murray is a former West Indian under-19 captain.